The travails of Prexy Nehemiah Dennison are many, but his minions certainly built enough roads to Moscow during the election, and his golf-day yesterday with Sean Hannity brought perhaps more advice about spinning more southern border wall nonsense on Easter, no less. He’s a busy guy, what with the legacy of Nehemiah. Whaa? Some guy on CNN who wrote a book “God & Donald Trump” just said Trump can’t go to church most Sundays because he’s “very busy”. HE’S GOLFING, FFS. I know Trumphumpers don’t know much but they don’t even know Trump. Nehemiah is blamed by the Rabbis for his seemingly boastful expression, “Think upon me, my God, for good” (Neh. v. 19, xiii. 31), and for his disparagement of his predecessors (ib. v. 15), among whom was Daniel. In the 20th year of Artaxerxes, king of Persia, (445/444 BC), Nehemiah was cup-bearer to the king. 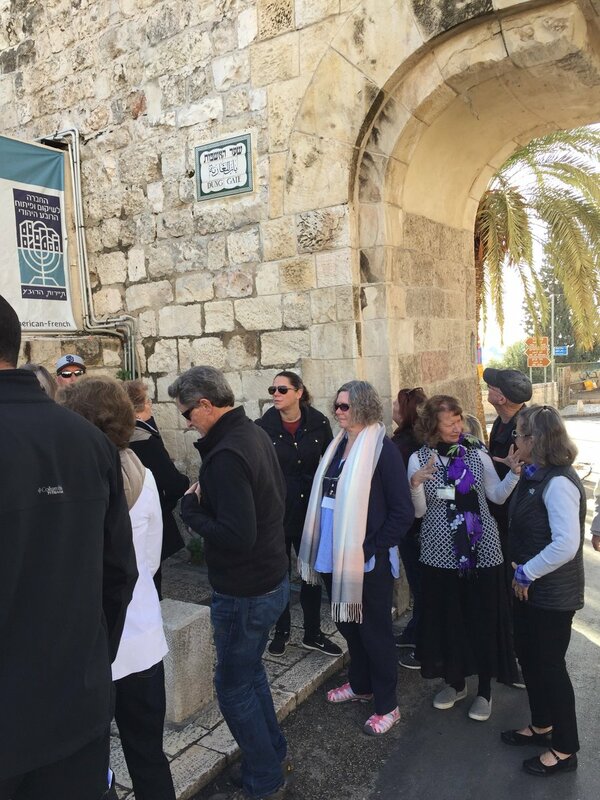 Learning that the remnant of Jews in Judah were in distress and that the walls of Jerusalem were broken down, he asked the king for permission to return and rebuild the city. Artaxerxes sent him to Judah as governor of the province with a mission to rebuild, letters explaining his support for the venture, and provision for timber from the king’s forest. Q: mr. President, what did you mean by no DACA deal? A: Mexico has got to help us at the border. If theyre not going to help us at the border, its a very sad thing. Mexico has got help us at the border. And a lot of people are coming in because they want to take advantage of DACA. And were going to have to really see. They had a great chance, the Democrats blew it. They had a great, great chance. But well have to take a look. But Mexico has got to help us at the border. They flow right through Mexico. They send them into the United States. Cant happen that way anymore. 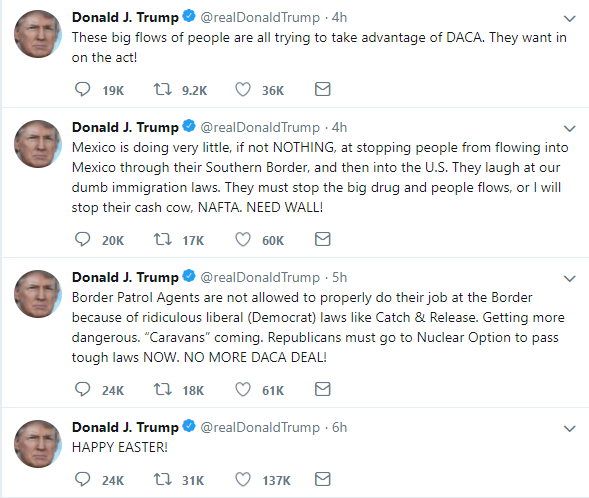 I now wish that Trump went golfing today instead of Easter Mass. He has been so unhinged in his most vile way, than currently in one day! On a day of remembrance and love, he’s only pushing hate! You know today must be a Christian holiday: Greedy, divorced, warmongering, judgmental, retaliatory Republicans, whoÃ¢ÂÂve made careers of withholding from the poor, are pretending to follow Jesus. Vandals over night splashed red paint on the left entrance sign of Trump international Golf Club where the president was yesterday… a spokeswoman for the Palm Beach County Sheriffs Office confirms the Secret Service is investigating the incident. At his own request Nehemiah is sent to Jerusalem as governor of Yehud, the official Persian name for Judah. Jerusalem had been conquered and destroyed by the Babylonians in 586 BC and Nehemiah finds it still in ruins. His task is to rebuild the walls and to re-populate the city. 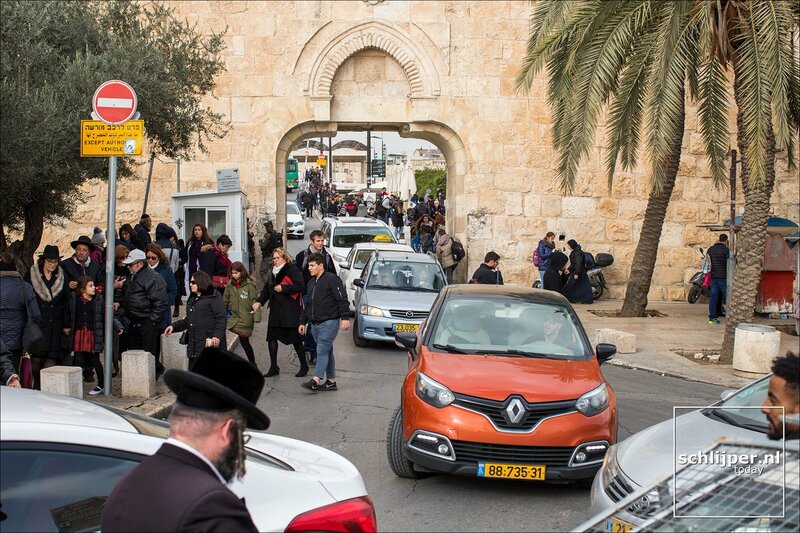 He faces opposition from three powerful neighbours, the Samaritans, the Ammonites, and the Arabs, as well as the city of Ashdod, but manages to rebuild the walls. Once there, Nehemiah defied the opposition of Judah’s enemies on all sides—Samaritans, Ammonites, Arabs and Philistines—and rebuilt the walls within 52 days, from the Sheep Gate in the North, the Hananeel Tower at the North West corner, the Fish Gate in the West, the Furnaces Tower at the Temple Mount’s South West corner, the Dung Gate in the South, the East Gate and the gate beneath the Golden Gate in the East. He then purifies the Jewish community by enforcing its segregation from its neighbours and enforces the laws of Moses. The name Sha’ar Ha’ashpot appears in the Book of Nehemiah 2:13-14. It is probably named after the residue that was taken from the Jewish Temple into the Valley of Hinnom, where it was burned. This ancient “Dung Gate” may not have been in the same location as the 16th-century gate, which only received this name in the 19th century. This entry was posted in 2016 Election, Celebrity, Christianity, Countries, Foreign Policy, Fundamentalism, Government, History, Immigrants, Judaism, Society, Uncategorized and tagged border, DACA, Donald Trump, Journalism, Media, Politics, Religion, trump. Bookmark the permalink.